Is there a charge if I see the Doctor about an ACC claim? Unfortunately, ACC only pays for part of the consultation which requires us to claim the remaining fee from you. I am pregnant will there be a charge to see the Doctor? Currently, all maternity-related consultations are free. Generally, the first 3 months of pregnancy care are provided in general practice and then an independent midwife provides your care. There is ample parking at the rear of the building. There is a bus stop adjacent to the surgery and also just beside the entrance to the carpark, for those travelling by the (number 7) Metro Bus Service . 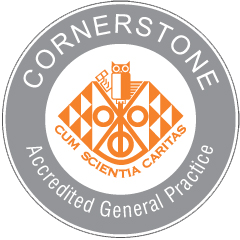 The aim of CORNERSTONE is to support continuous quality improvement across general practice, in conjunction with the achievement of accreditation, by way of an assessment of a practice against Aiming for Excellence. The achievement of a CORNERSTONE accredited practice signifies a practice’s commitment to patients by meeting legal/safety standards, essential standards as set by a multi disciplinary development team.